It’s been a whole year. 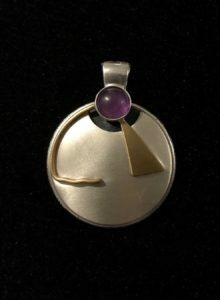 A pendant each week for a year, exploring the meaning of health, the components of health, and the practical things that make me feel healthy. From ice cream to organization, they’ve been varied. Above all, I’ve confirmed that making things is good for me. 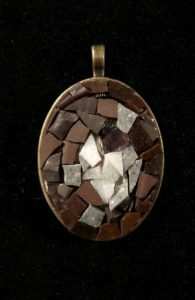 The act of transforming one thing into another, the chance to play with ideas, and the calm and concentration that making each pendant required was healthy. 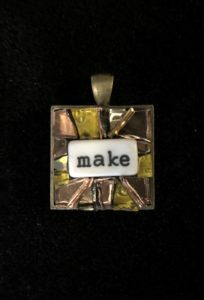 At the center of this pendant is the word “make”. It’s a command, a reminder. Every corner of the city has police directing traffic and half the streets are closed off to make space for construction of new train stations. It feels chaotic and hard to get from place to place. But at the same time I’m forced to explore new parts of the city and look around as I drive down streets I’ve never traveled. The detours will take more time, but maybe they’ll bring me somewhere exciting. 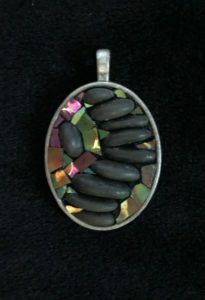 This pendant uses stones to create a long, winding barrier. The smooth surfaces around them, made of iridized glass, are the exciting potential of the unexplored. Music flows through our days. Every person in our family uses music in a different way, listening, playing, singing, dancing to it, drawing it. There’s a beauty in the music and all of the connections, release and expression that it allows, but for me there’s also a beauty in the silence that follows. 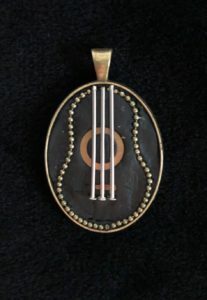 This pendant captures both the music, through chain and antique watch parts that suggest the form of a guitar, and also the silence, through dark spaces in between the elements. Literacy and the impact that it has on health has been poking its head out again and again this week. I talked to a class about political murals and the way they’re designed to be “read” quickly and easily by using symbols instead of letters, I thought about the work I did at La Alianza Hispana on health literacy and the drawings I made in Guatemala to help low-literacy teachers collect data about their preschool students’ health. All the while I’ve been watching my 4 year-old begin to piece together letters and connect sounds to each one. He’s so lucky to have the time and the support to turn his curiosity into strong reading skills. 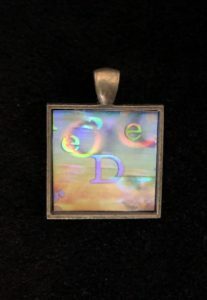 The pendant is made from a hologram of letters cut from the front of an old brochure. The photo doesn’t do it justice, but different letters appear as the hologram turns and catches the light in new ways. In honor of tonight’s display of breast-pumping photos and stories at Somerville city hall I’ve made this breast-like pendant. Milk is sustenance. Milk is life. Milk is hard to produce (I can tell you I needed a LOT of donuts each day that I was lactating) and hard to store. And we don’t talk about it enough. There’s still a long way to go before working women in the U.S. have the support, space, time and encouragement that they need to continue to breastfeed after returning to their jobs. It might seem like sadness couldn’t be part of health, but every emotion has a flip-side, and feeling them all is healthy. 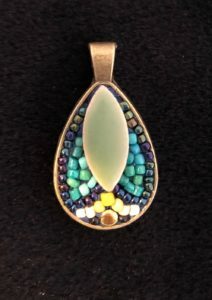 This pendant is shaped like a tear, and the green ceramic tile that sits at its point echoes the same form. With beads placed in lines that sweep away from the tile’s point, the design takes on an art nouveau quality. Beauty in sadness. Almost all the way through a whole year of pendants (this is week 46 of 52), I’ve been amazed at how much the seasons affect my health, by mood and my connections to other people. Snow might be beautiful, but it definitely makes it hard to manage playground meet-ups. Spring and summer are far too short, but at least the seasons march around and swing us back toward spring each time the snow thaws. 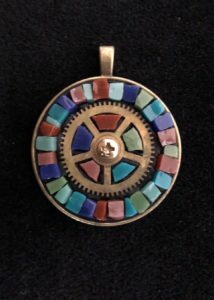 This pendant has a gear at the center, symbolizing the turning of the seasons, and around the edges are some of the colors and textures of each season, from the icy whites and shiny blues of winter at the top through the bright greens of spring, the flower hues of summer and the rusts and golds of fall. Maybe it’s a little too literal for a pendant about health, but after having the flu for a week all of my glass looks like germs. A few weeks ago I ordered the kids a bottle of lotion that glows under UV light and we used it to practice handwashing. It’s pretty scary to see what a 4 year-old leaves on his hands when he “washes” them, and it reminds me why I’ve been getting sick so often. 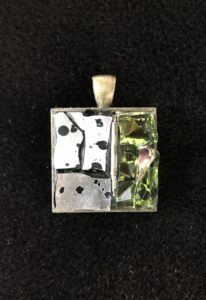 The left side of this pendant is some germy-looking glass with a silvered finish, and on the right is the flip-side of the same glass, with a brighter, healthier looking shine. Last week the kids and I watched a Magic School Bus episode about recycling and reuse, and it showed the way the world would be if we didn’t recycle. Piles of garbage, playground equipment turned back into the bottles and cans that it had been made out of, and no more trees. I found this earring in my salvage pile, beautifully made by another artist, but broken. Instead of throwing it out I’ve turned it into a pendant and given it a second life. Political decisions are so mired in the present that no one is taking a moment to balance short-term wins with long-term implications. Even though I’ve never been a big fan of science fiction, it’s future-focused, trying to imagine how everything will play out if we change a factor or set something in motion. It seems to me that that’s what we’re missing right now at the highest levels, a little bit of imagination and forethought. 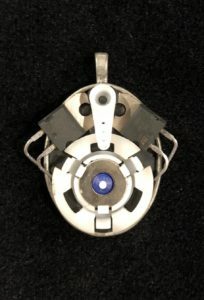 This pendant uses cast-off pieces of technology to create a form that looks like a transponder…or a spaceship…or whatever futuristic gadget you can imagine. It’s so satisfying to find the right place for something, to put it back where it belongs. When the things around me are organized I feel calmer, but that doesn’t mean that I want to have less things or to have less variety, just that each thing should have its ‘right’ place. This pendant makes a series of perfect places, an array of interesting objects. 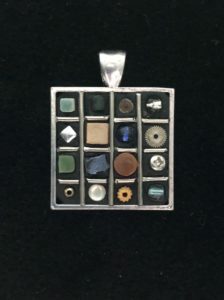 Using jewelry findings as dividers, the objects in the pendant vary in texture, color and form, making a beautiful, and organized, collection. I’ve known some of my friends for many decades now, and as we’ve grown we’ve shaped each other. Through debate, conversation and shared experiences we’ve become more alike, even if just in tiny ways. Friendships are like influences that you get to choose. Choose a person who you admire as a friend, and as you spend time together a little bit of that person gets absorbed. 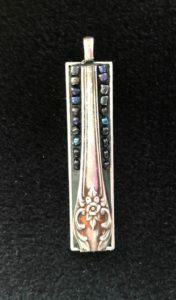 This pendant represents two people merging and influencing one another. The complimentary (and opposite) colors of purple and yellow meet, blend together slightly, and become something richer and more interesting. It’s been amazing to watch my friends’ children turn into people with real personalities, interests, and goals. As they grow I can start to see which parts of them are passed down from their parents, and which parts are all their own. When I think about my own greats and great-greats I don’t know exactly what’s been passed down to me, but I have some objects that give me a sense of who they were. 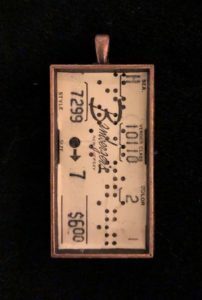 This pendant is made from the tag that was attached to a pair of leather gloves that were bought (and never worn) by my great-grandmother. They made their way to me, but don’t fit on my hands. Clearly I didn’t inherit her bone structure, but maybe I have other parts of her hidden inside. Racism and sexism keep people from even being exposed to fields that might interest them, jobs that might offer better pay and educational paths that could lead in new directions. 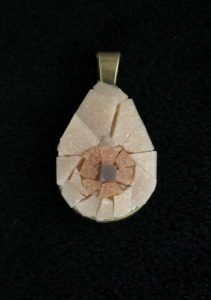 This pendant explores what it would look like if there were equal opportunity and equal exposure. The gear at the center is like a merry-go-round that turns, letting people on and off at different stops along the way. There’s some randomness in the system, but if the people on the merry-go-round are diverse, and they all have a chance to get off at any stop, then we’ll move closer to the diversity of the crowd that forms a border. Today, as I move through a milestone birthday, it’s clear that aging can happen with fear, with wistfulness, or with grace. I suppose there’s always a mixture of the three, but I hope grace can take the lead. 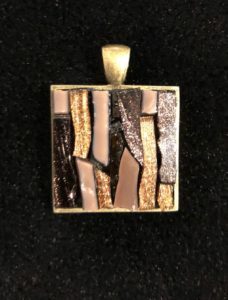 I chose the pieces in this pendant to match my own colors. The brown of my hair, now mixed with gray and silver, the purple that still peeks through, and the bits and baubles that I have to use to fix the parts of me that break now and then. All of these pieces, each one unique and imperfect, are set in an adhesive that I mixed to the color of my skin. I spent some time thinking about how best to represent joy, jumping immediately to bold colors and moving away from the calm blues and greens that I’m always drawn to. But what shapes represent joy? 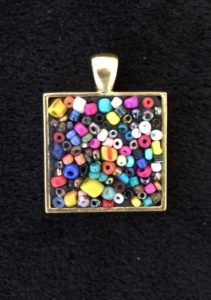 Joy spreads, joy spills, joy radiates, but joy certainly isn’t carefully placed and contained, so when it came time to actually make the pendant, what felt right was to spill the colorful beads and let them land as they wished, frozen in the unplanned shapes and bold color combinations that they happened to form. After working on other pendants for hours with tweezers to turn individual beads on their sides to hide their holes it was liberating and joyful to leave each piece as it landed. A few weeks ago, a friend stopped by with a whole truckload of antique mosaic tiles and told me their story. He’d rescued them from a warehouse that his family’s business is about to sell. They’re from Italy, and must have come from a project 50 or 60 years ago. Near them in the warehouse are marble statues of saints that no one can quite explain. A whole box of the tiles are curved corner tiles. Turned upside-down they look like little books. 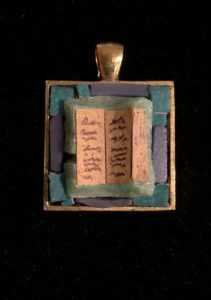 This pendant combines the tiles that arrived dusty and worn from the warehouse with pieces of wallpaper that was buried two layers below the surface in our house when we bought it to make a tiny book of stories. The stories aren’t easy to read, but they make me curious. This pendant definitely bends the rules as far as what counts as mosaic, but since I made the rules for this project, I can bend them. I’ve been trying for weeks to mosaic the image of a peacock feather, and it’s been super hard. At the small scale of a pendant, none of them came out even resembling a feather. So, frustrated, I decided to just use a real peacock feather. And, lo and behold, it’s more beautiful than anything that I could have done to copy it. 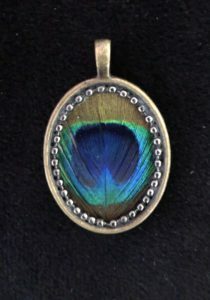 And, by happy coincidence, I get to post a pendant of a turkey feather on Thanksgiving! The gray days are getting more intense, and every year at this time I wonder why anyone chooses to live in New England. I long for sunshine, and I’m not convinced that the special light therapy lamp I have in the living room will help as much as a dose of actual sunshine. 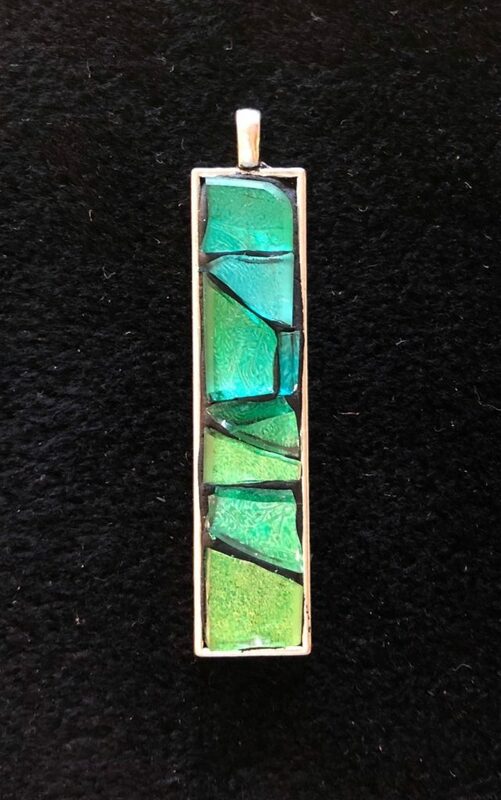 This pendant repurposes mirrored golden glass into a sunny, light-bouncing necklace. 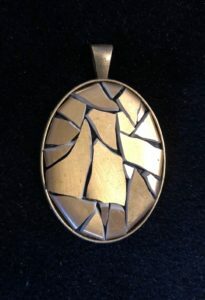 What caught my eye about the plate that turned into this pendant was its small size, the sophistication of its edges, and its antiqued shine. Before I could break it and make it into something new and shiny my 4 year-old pinned a “note” to it that said I couldn’t break it because it was made in the woods by Rama and Sita during their exile. The good news is that some version of the story of Diwali is sinking in for him, and that the plate does indeed have a special pull to it. I broke a second plate, keeping the one he had connected to Rama and Sita intact. 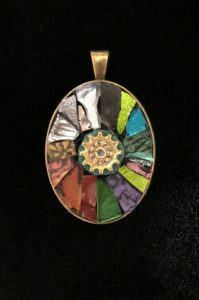 This pendant is a nod to the beauty that comes with retelling stories through the generations and the dignity that objects can absorb from the history we ascribe to them. I’ve been thinking about how much privacy matters, and how it can be comforting to know that something will be kept confidential, but also about how being closed off can make it hard to deepen relationships. 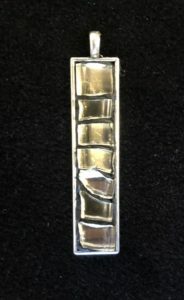 As I made this pendant with dark strips of glass that suggested bars obscuring a view, I wanted to make the bars irregular, allowing small glimpses between them. What emerged looked a lot like tree bark, the tree’s way of protecting itself. The glass ceiling is an image that’s always intrigued me. A beautiful idea, being able to look up at the stars or the clouds, but also a barrier to reaching the sky. As far as my professional world is concerned, there’s a glut of women in both art and public health, but the most lucrative and respected positions are still held by men. 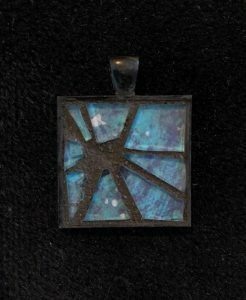 But I’m a glass artist, and I break glass all the time, so I’ve thrown a rock at this particular glass ceiling. 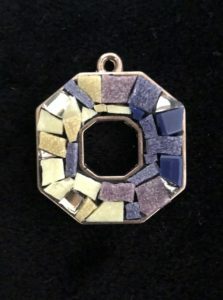 Made with paper set under clear glass and grouted to highlight the broken spaces, this pendant about challenging unspoken rules is also an untraditional mosaic that challenges the expectations of what can become tesserae. It’s about time. I’m finding myself setting my alarm clock and sometimes even using my phone as aback-up alarm. And when I have a few minutes in between meetings it’s like a little breather, but I’m still watching the clock, counting the minutes until I have to do the next thing. 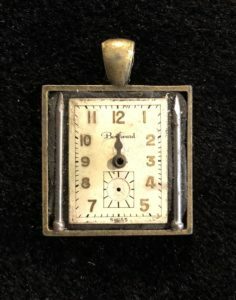 So this pendant slows time down. Actually, it stops it. With the hands of an antique clock set to mid-day it just holds time in place, relishing all the possibility that afternoon holds.